Heat coals or gas grill for direct heat. Mix dressing and parsley; set aside. Brush mushrooms, yellow squash and bell peppers with oil. Place vegetables in grill basket or directly on grill rack. Cover and grill 4 to 5 inches from medium heat 5 to 7 minutes, turning occasionally, until vegetables are crisp-tender. To serve, arrange mushrooms around edge of serving platter and remaining grilled vegetables in centre; sprinkle with tomatoes. 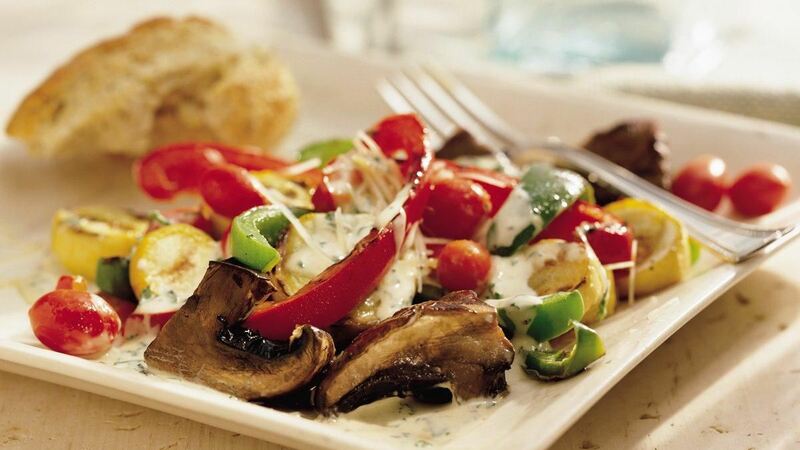 Drizzle dressing over vegetables. Sprinkle with cheese. Serve at room temperature. Variation: Toss the vegetables with your favourite pasta and sprinkle with cheese.